Hey, that's me, a volunteer! This week, I've been walking around my precinct distributing the BoCoDems 2016 Voter Guide. 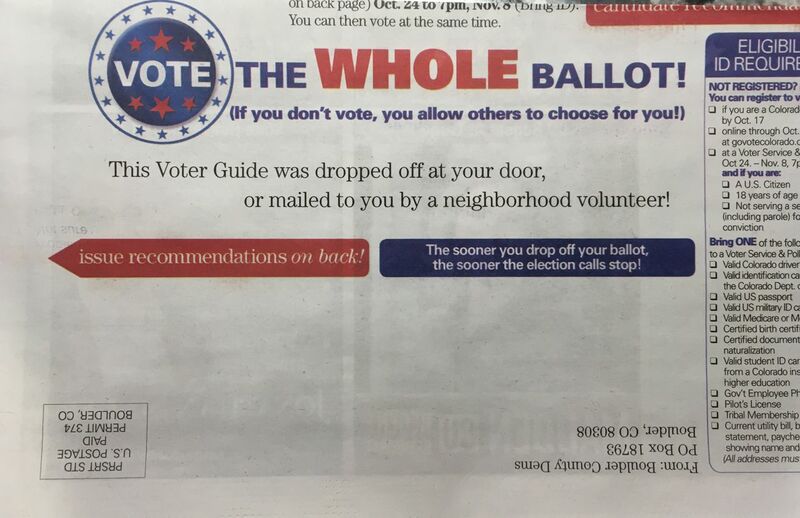 This Voter Guide was dropped off at your door, or mailed to you by a neighborhood volunteer!" It's a long ballot, with many Ballot Issues. By press time, the BoCoDems had made recommendations on all but 4 of the initiatives. Once again, my Colorado friend has written a well-considered guide to the issues. To learn more, go to Colorado and Boulder Ballot Issues. 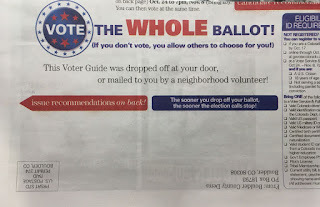 The two guides differ on Boulder County Issues 1B & 1C and BVSD Issue 3A. So please read them and make up your own mind. As long as I have your attention, vote the down-ticket races. If you don't vote, then someone else decides for you. Moreover, you won't get national candidates that you are happy with unless you give them experience at the local level. Get civically-engaged. Convince your friends and family to become civically-engaged. We have a presidential candidate for a major party that says very dangerous things about minorities, women, the disabled and climate scientists. This election hits very close to home. If nothing else, please vote to protect me. 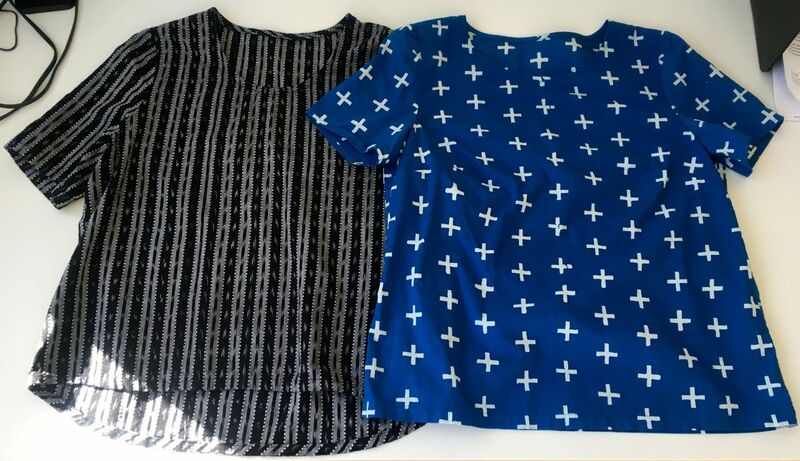 I made two woven t-shirts this summer. 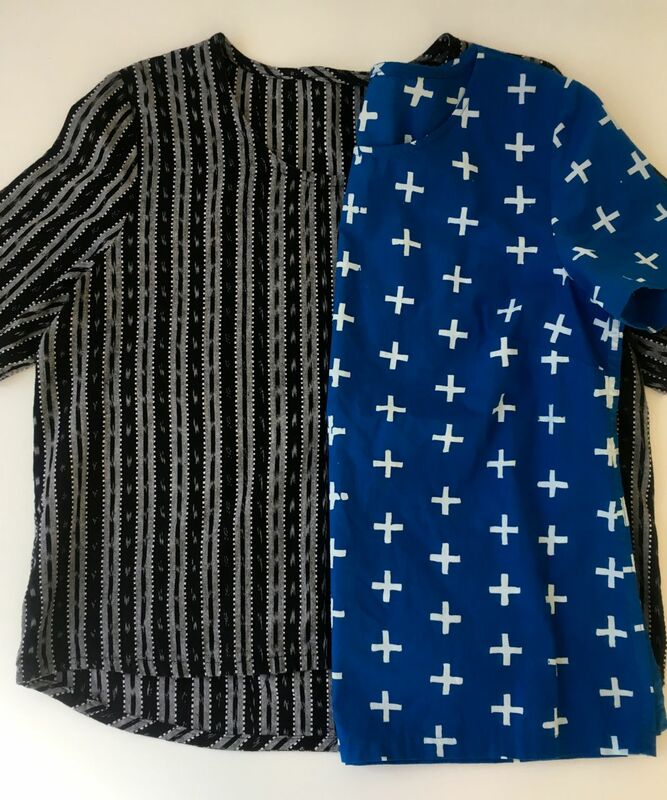 I used an old pattern for knits (8998 left) and a new one for wovens (6610 right). 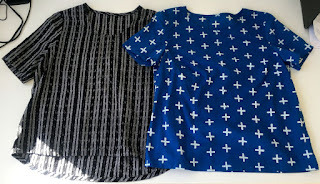 I bought the black/gray ikat in NYC while shopping with Claudine. I found the blue batik in the remnant basket at Fancy Tiger*. Both envelopes describe the tops as semi-fitted. I had previously used Burda 8998 with wovens before, and remembered to size up from 14 to 16 (going from knit to woven). 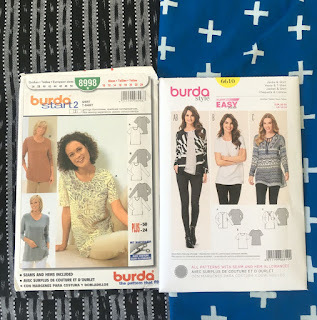 Since Burda 6610 is designed for wovens, I made it in size 14. If I lay 6610 on top of 8998, you can see that the black one is slightly roomier. 6610 has bust darts, for a better fit. It also has back shoulder darts! I shaped the hem on the black t-shirt for a slight elliptical high-low effect. 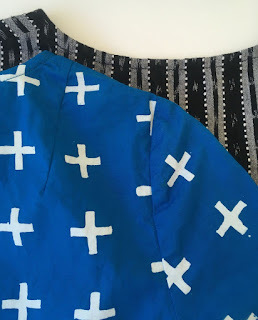 To help the hem lay flat, I hemmed it with a bias strip instead of a turned hem. I'm wearing it with Simplicity 1887 shorts Version 2 in the photo below. The front shoulder slope for 8998 does not match the slope of the back piece. 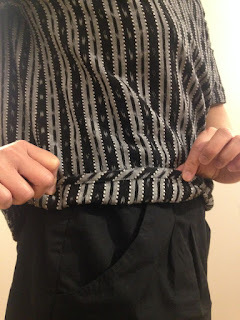 If you don't trim it to fit the back, the shoulder seam slants toward the back in an odd way. The rest of the pattern is drafted accurately. Burda 6610 is drafted really well, and I appreciate the way the darts elevate the fit and look. It's a bit tighter around the upper chest than I like. Next time, I will either size up to a 16 or use a stretch woven if I sew a size 14. YMMV. Fit is subjective and I prefer roomy over tight. I think this top will go to my DD, who says she would like some more color in her wardrobe. 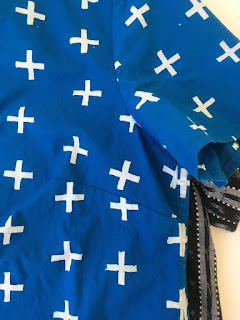 * Last Saturday, I took a fabric shop tour of Denver, visiting Fancy Tiger, Fabric Bliss and Colorado Fabrics while working my way south to IKEA. 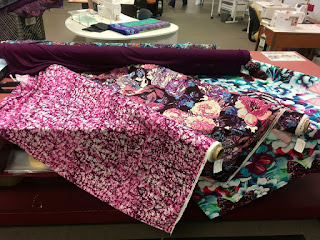 I chanced upon Fabric Bliss while going to an exhibition at Metro State Univ Center for Visual Arts. The Broadway and Santa Fe corridors are chock-full of galleries and interesting shops for makers. If you are visiting Denver, I highly recommend spending a half day or more in this area. 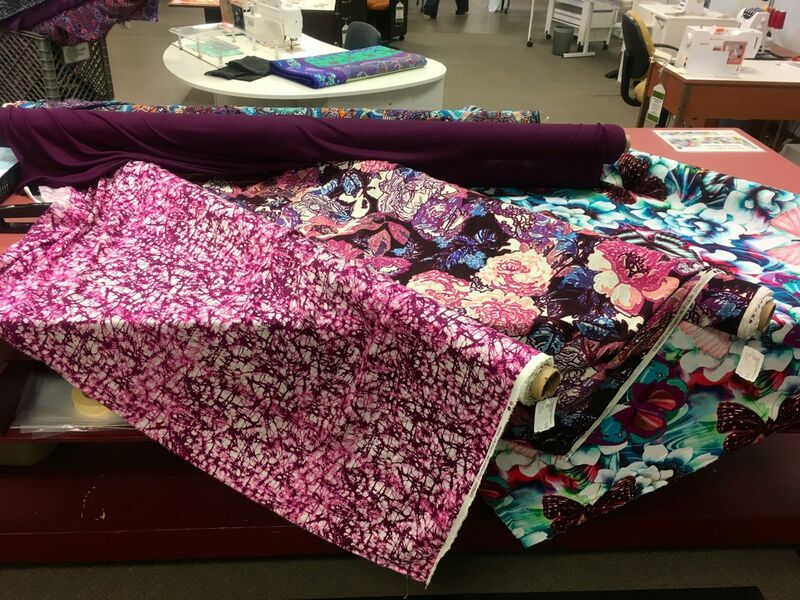 Colorado Fabrics is the largest fabric store in our time zone and, when they move in January, they will be huge. Right now, they don't have enough room to stock everything they would like; the selection of apparel fabrics is hit or miss. Last June, I didn't find anything to tempt me other than the hard-to-find notions on my shopping list. They offer a good selection of designer overstock fabrics in the front, mostly from LA and NY, at NYC garment district prices. They also have a big and well-organized bargain section in the back with lower quality (but still good!) fabrics at LA-area (lower than NYC) prices. Last weekend, I wanted to take home all the fabrics from the front section. These digitally-printed rayon challises have a delightful hand. Three of them came home with me. If we want brick and mortar fabric stores to stay in business, we have to support them. I'm happy to do my part. And the fabrics I brought home are drool-worthy. I'm sure you'll see more of them later.